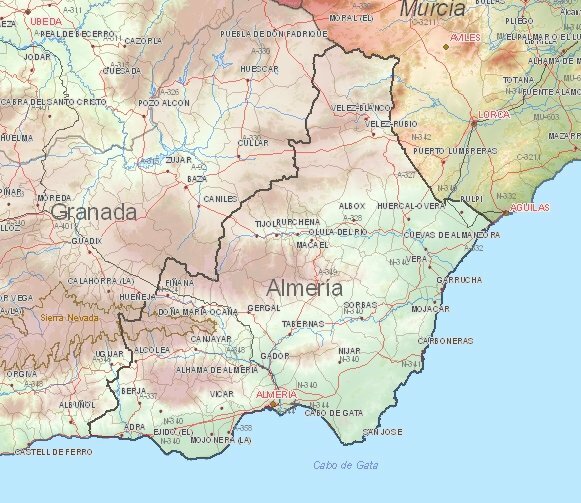 On beach holidays to South East Spain Almería? : The top-attraction is the Alcazaba, the largest Moorish fortress in Spain. : Archaeological site with remains of the first metalworking culture of Spain 20 kilometers northwest of Almeria. : The Agate cape is a geological wonder of volcanic origin and consists of beaches, dunes, cliffs and salt pans. : Caves in Velez-Blanco (north of the province) with drawings from 4000 BC. : Visit at Tabernas Mini Hollywood where films such as The Good, the Bad and the Ugly, For A Few Dollars More and Once Upon a Time in the West were taken. Soon Almería webcam, blogs, travelreports, spanish recipes and movie locations. 1) Current weather in Almeria (temperature, precipitation).